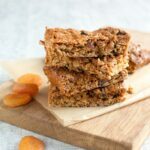 These energy-packed vegan fruit flapjacks are yummy, chewy and, above all, simple to make. A fruit-filled treat great for breakfast or for snacking on during the day. Preheat the oven to 160C/ 320F. Line a small baking tray with baking paper. Add agave nectar, coconut oil and sugar into a medium saucepan and heat over a medium heat. Stir everything together until the sugar has melted and you have a syrupy consistency, then remove from the pan. In a large bowl, mix together the flour, ginger, cinnamon, oats and mixed dried fruit until combined. In a small bowl mix the bicarbonate of soda with a tablespoon of hot water, stir until dissolved and add into the bowl with the dry ingredients. Pour in the prepared sugar mixture and mix all the ingredients together until evenly combined. Spread the mixture into the prepared baking tray, using a wooden spoon to push the mixture into the corners and flatten the top. Bake in the middle of the oven for about 20 minutes or until golden brown on top and nicely crisp on the edges. Leave in the tray until cool. Once cooled, cut into slices and serve. Transfer to an airtight box and store for up to 5-7 days.